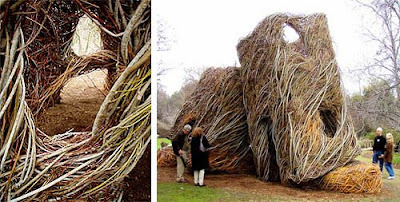 Environmental artist Patrick Dougherty has installed Catawampus at the Los Angeles Arboretum. 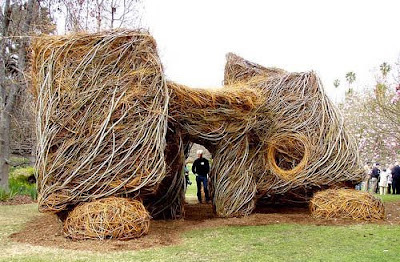 Catawampus is an installation of willow saplings in the form of a gestural house. I particularly enjoy that this beautiful, interactive piece is friendly to all ages and handicaps! Also, check out the Flickr site to see how it was built. There was an installation of these at the Columbus botanical garden a year or two ago, dunno if they're still there.